Monday night the Florida Marlins had an exciting walk-off win against the Los Angeles Dodgers. Naturally, the team stormed from the dugout to join in the celebration at home plate. However, as the Miami Herald reported, one person, our very favorite Tweep Logan Morrison joined the crowd, jumping up and down. Why is that a problem? Well LoMo had his cast removed earlier in the day and is still on the disabled list. Manager Edwin Rodriguez had what he called “a very mature conversation about it. It was — what do you call that? — a monologue.” The Marlins left fielder also released SEVERAL PICTURES of his foot pre- and post-cast. He is planning on auctioning off the cast, which was signed by his Fish teammates, on eBay with proceeds going to the American Lung Association. 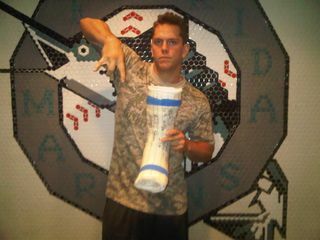 BTW — If you’re not following @LoMoMarlins on Twitter, you’re really missing out. This entry was posted in Florida Marlins, Injuries, Los Angeles Dodgers, Outfielders and tagged American Lung Association, Baseball, Baseball Injuries, eBay, Edwin Rodríguez, Florida Marlins, Logan Morrison, Los Angeles Dodgers, Major League Baseball, Miami Herald, Pictures, Twitter. Bookmark the permalink.